T3 recently attended a hands on play session in London for the Xbox One X edition of Forza Motorsport 7. And, after spending some time with Microsoft's hot new racer, these are the things that we learned. We also got chance to play a bunch of other Xbox One X titles, as well as tinker with the hardware some, however, for our thoughts on those you'll need to head on over to our pre-launch hands on review of the console which is being updated all the time. We also got to go up close and personal with the already sold out Xbox One X: Project Scorpio Edition, and we can confirm that it looks as good as the pictures led us to believe - if you can find one then it should definitely be your choice of system during the launch window. Forza Motorsport 7 was designed to run primarily on the Xbox One X, a fact that sees it tap into its spectacular power. The result is incredibly impressive, with the machine not only spitting the game out at a 4K resolution and with HDR enabled, but also at 60 frames per second. We've been saying for years at T3 that frame rate is, arguably, more important to the quality of a title's gameplay than raw fidelity, and from what we've played of Forza on Xbox One X, that point couldn't be truer. The smoothness of the experience was excellent and genuinely added to the immersion. And talking of immersion, one of the neatest things we noticed about Forza Motorsport 7 was how when you were gunning it in a top marque, the entire cabin shook realistically, generating an even greater feeling that you were travelling very fast on track. Even individual parts of the cockpit and car would shake and move independently, such as hoods and rear-view mirrors, while the in-game camera moved as well. Unlike many racers that get the speed right but feel floaty and unreal, Forza felt super fast, weighty, and genuine. Petrolheads are going to be very impressed with the quantity of both cars and tracks included in Forza Motorsport 7. 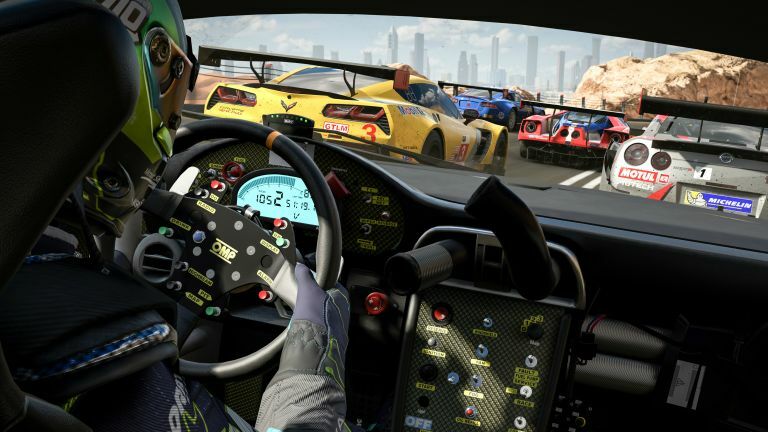 There are more than 700 cars, with all the luxury makers such as Ferrari, Lamborghini and Porsche in play, as well as 30 wonderfully realised tracks to race around in the game. Each of these cars is wonderfully constructed as well, with incredible attention to detail - you can open doors, nose around the interior and admire every nut, switch and sculpted body panel. The Xbox One X supports Dolby Atmos and, well, it will be used to excellent effect in Forza Motorsport 7. That's because an incredible amount work has been done to not only make the cars themselves sound just like their real-life equivalents, with authentic engine noise, but also to make the experience of driving fast in a high-performance racer sound realistic too. Tyre screech, stones and pebbles being flicked up onto the vehicle's body work and undercarriage, rain spattering on the windscreen and more are delivered in excellent fidelity and combine to enhance the immersion. Lastly, if you are tired of playing a generic, middle-aged guy in every racing game you pick up, then you're going to enjoy Forza Motorsport 7's customisation options. Not only can you choose a male or female avatar to drive with, but you can also customise them with hundreds of pieces of custom driver gear. This gear ranges from full racing suits to colour schemes, and from skins to company logos and decals. As with the cars, many of these pieces of gear can be unlocked by winning races in-game.